Here’s some before pics and some after pics of a deck in Westville that had rotted and was removed and replaced. The original deck had been built using H2 CCA Treated pine as a structure and what looked like balau deck boards and H2 CCA treated timber was used in the balustrade. See here for an article on the correct Hazard Classification for using treated pine in outdoor projects. 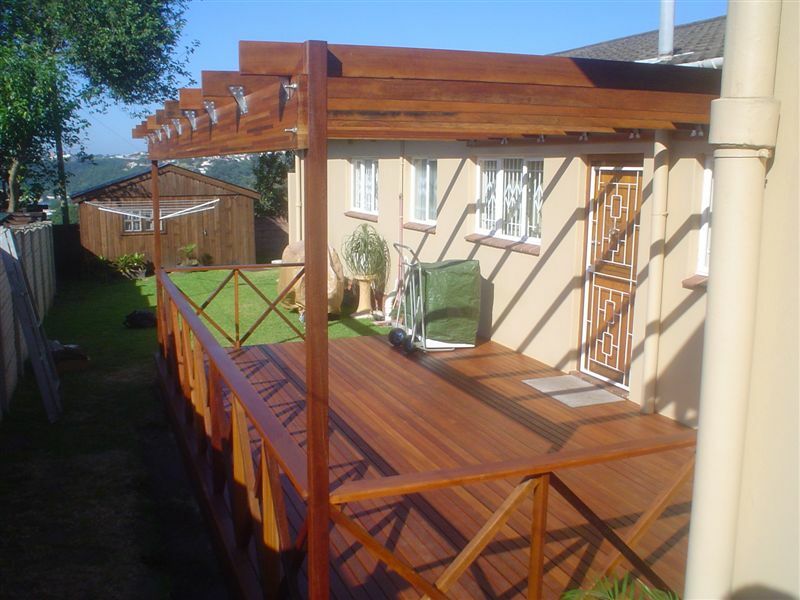 https://blog.thewoodjoint.co.za/2015/06/21/balau-vs-cca-treated-substructure-in-your-wooden-deck-durban-and-cape-town/. It is vitally important to use at least H3 CCA treated pine in any outdoor application where occasional wetting occurs. H2 CCA pine is designed for roofs and will rot outdoors. H3 is designed for outdoors and will last at least 50 years outdoors in the rain provided it has a chance to dry out after it rains. The balau deck boards on this deck run in the opposite direction to the way we normally build them. In other words they run the width rather than the length. The reason for this was that we needed to follow the curve of the existing paving and running the deck boards the length would have resulted in long thin slivers of deck boards to get the curve. Running them the width meant we could cut the end of the deck board to follow the curve. A much neater job at the end of the day and less chance of splintering. Because of the way the deck boards run it results in short main beams and longer joists as can be seen from the front view of the deck. The mean beams always run in the same direction as the deck boards with joists on top of beams running perpendicular to deck boards. The ends of these main beams of 228mm can look unsightly and can be clad to cover the pine. In this instance though the client opted not to clad them as there is unfortunately an additional cost and the front of this deck is not really seen unless one is standing in the garden on the lower level. We did clad the sides though as these are very visible. This we did at no extra cost. You know, “going the extra mile” and all. The balustrade is full balau this time around and should outlast at least me. Maybe not my kids, as all wood will rot in time. The balau just takes a lot longer to rot which makes it the ideal outdoor timber to be used in timber decks and balustrades. The deck was oiled as opposed to being coated which retains the natural look and feel of the wood and is easy to maintain going forward as you simply clean it and put more oil on it. For a free no obligation quote on your timber decking, balustrade, pergola, screens and other outdoor work, please contact us on 031 – 762 1795 or use the contact us form below. We also supply install in door wooden floors. This client in Hillcrest had this irregular shaped “dead space” that she wanted to deck. Because it doesn’t get much sun, it is always wet and muddy. So we decked it in balau deck boards. The contrast between white paving and wooden decking works very well and the actual shape of the deck makes it what it is. In designing an outside area, one should try to use different materials that compliment each other. Too much wood or too much grass doesn’t work. But a bit of wood, grass and paving works very well and compliments each other. The challenges were in getting the top of the deck flush with the top of the paving because the corners of the paving are rounded over so unfortunately we had to leave a small space between the board and the top of paving. Although the board is butted up tight against the paving because of the round over a small gap is created. It didn’t however look bad at all and works well. It wasn’t practical to chamfer the end of the deck board as it would have resulted in a very thin sliver that would cause problems down the line. We decided on leaving the far end straight rather than trying to follow the curve of the rock wall. The gap was then taken up with loose stones flush with the top of the deck. Another happy client adding to the 99.5% happy rate of our clients. For a free no obligation quote on your decking, and other timber requirements please contact us on 031 – 762 1795, 082 496 5444 or use the contact us form below. We work throughout KZN and have four crews of skilled deck builders with multiple vans to get the done quickly, accurately and to your satisfaction. This was a wooden deck built in balau for a client who had opened a Bed and Breakfast on the coast. As you can see form the pics the wooden deck was built in the front of the property overlooking the sea. There were of course strict time lines in which we had to complete this wooden deck as they had already made confirmed bookings. With these job which are a fair distance from home we normally rent accommodation and pay the builders a live out allowance for food etc. It inevitably pushes the cost of the build up slightly which is unavoidable. There are some before and after pics in this article. We had to excavate the soil below. It is always best to leave a fair amount of space below the bottom of the structure and the bottom of the deck boards to allow sufficient airflow for water evaporation. If the deck structure is touching the ground then one would need to use H4 CCA Treated timber which has a minimum life span of 20 years in constant contact with wet soil as per SAWPA (South African Wood Preservers Association). H3 CCA Treated pine as a structure which is NOT in constant contact with wet soil has a minimum life span of 50 years if correctly installed. So it makes sense to keep the structure to H3 for cost purposes, and expected minimum life span, but keep it well clear of any soil. By allowing air to flow freely between the structure and the ground keeps everything relatively dry below and the deck structure will last a lot longer. Continual dampness below speeds up rot and premature failure. In this instance we excavated to at least 300mm below the structure. There was a pool that had been installed prior to our build by Clear Blue Pools – Gary Botha (071 679 1013) and we worked closely with the pool builder so that the concrete ring beam of the pool was set down 60mm from the desired deck height (top of deck). This allows us a 40mm batten on top of the concrete ring beam and a 19mm deck board. 40mm is the minimum we like to allow for this purpose, again to allow for sufficient air flow to keep things dry between the deck surface and the ring beam. These cleats or battens are fixed directly to the concrete ring beam and the rest of the joists which are suspended above soil become a 38 x 114 to give it lateral strength. The rest of the deck was pretty much the same then as the other decks we’ve built using 19 x 68mm yellow balau deck boards, counter sunk screw holes filled with clear epoxy and saw dust mixture, sanded flat and oiled using a decking oil. For a free no obligation quote on your deck please call us on 031 – 762 1795 or use the contact us form below. A wooden pergola is a structure above that is designed using timber beams, purlins and slats. It is largely decorative as it does not prevent rain and provides limited shade depending on how many slats are installed. They are sometimes referred to as Sun Screens and can be built in such a way as to offer shade at certain times of the day by adding more or less slats to the top. There are a multitude of designs and they are only limited by ones imagination, and of course budget. They can be attached to the main building and then supported by posts on the front edge or they can be free-standing with posts to ground. One can install roof sheeting above to keep the rain out, but often it is better to consider an aluminium awning for this application due to cost. A balau pergola is not the cheapest method, but does add a nice appealing underside to your covering. Wooden pergolas can also be installed using thatching laths to give them a more rustic look and feel. Should you require a quote on a pergola or any other timber construction for your home, please call us on 031 – 762 1795 or use the form below. This deck was built with Massaranduba. Although Massaranduba is about 30% more per square metre than balau the client insisted on it as it is a much harder and denser wood than balau. As such it will last longer. It has a slight reddish tinge to it. This deck is to be left unsealed so will eventually turn grey / sliver. Therefore one will not notice that is massaranduba, but it will last longer. When choosing between balau or massaranduba one needs to weigh up the difference in cost vs. the longevity of both timbers. There is nothing wrong with balau, it will also give you a long life span. Massa is of a better quality and will therefore outlast balau. We decked around the pool flush with the tiling on the patio which resulted in a single 90mm deck board being used as a fascia on the inside of the pool. Hence the difference in height between the water level and the deck is not that great. Often the deck can come up too high resulting in a big step up to the deck from water level. The pool therefore needs to be set at the correct height, in relation to the patio, to accommodate the deck at the correct height. A quick note on new pool decks. The hardwood typically used in decking contains tannins which leach out when it rains. Storing them on a tiled surface almost always results in stains being left on the tiles after a downpour. Likewise one needs to be careful of installing the fascia on the inside of the pool, or deck boards that are installed on the pool’s edge, prior to filling the pool with water. If there is no water in the pool and it rains, these tannins will leach out and run down the new marbelite pool surface, staining it. The only way to get rid of the stains successfully is to sand it off. It is advisable therefore to get the pool done and filled before decking up to the sides of the pool and installing the fascia board. Alternatively, don’t marbelite until these tannins have completely leached out. It’s a tricky one because the pool contractor doesn’t want to marbelite until the lawn is done because of dust. The landscaper normally comes last, so it’s a bit of juggling that is required. We decked around a circular concrete slab which is to be a fire pit and up to the edge of the brick and plaster bench around the fire pit. We also installed a small pergola above the sliding door and included a small bar counter that can be accessed from both sides of the patio and deck. There was also a small decked area at the back of the house next to the fish pond and a screen on the front of the house. For the screen we used a 20 x 30 slat instead of a normal 19 x 68 deck board. Although a 19 x 68 deck board works well as a screen, a narrower piece (30mm) with a smaller gap is a bit different and not the run of the mill timber screening. Although it is slightly more expensive than a normal 68mm wide deck board screen, it is very effective. All in all a very nice job to work on and a pleasure to work with Massaranduba. It is lovely stuff. Hard as nails and long-lasting. For a free no obligation quote on your wooden decking, pergola or screening needs in Durban or Cape Town, please call us on 031 – 762 1795 or use the contact us form below. Pictured is a bench with a curved centre backrest. The benches we now make have a straight piece as the centre back rest. The curved top backrest remains as pictured. This was a lovely job to have received. 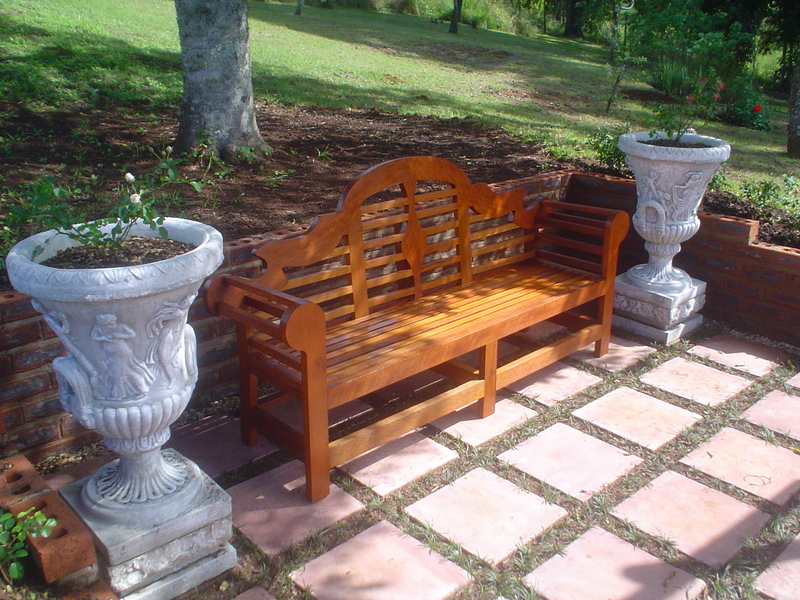 A client found me on the internet and came across some of the outdoor furniture I was making. Before I started building wooden decks I made furniture, largely outdoor picnic tables, Adirondack chairs and the like. I think I’ve mentioned it before in this blog, but it is difficult to make a decent living making furniture in South Africa. The imports that exist nowadays are so cheap and unfortunately people almost always look at price before quality. 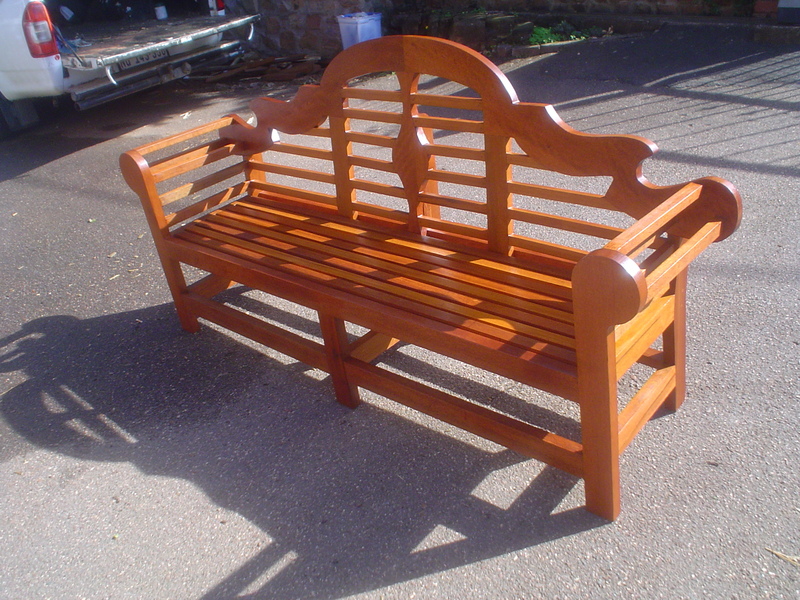 Nevertheless, I was approached by this client and commissioned to make this bench. Lutyens Bench is a bench that was designed and first built prior to 1913 by the Edwardian architect Sir Edwin Lutyens (the Dutch name is pronounced “Lut-chins”). They have since become very popular and are very distinctive in their design as can be seen. The client brought me the plans which he had ordered online and they had been delivered to him in full size of scale 1:1. All of the pieces came as templates and they were cut out and the pieces of MDF then cut from them. I made a few templates for the curved pieces from supawood or MDF. MDF is easy to shape as it is relatively soft and can be worked quite easily. Once I had a template I rough cut my balau slightly larger than it needed to be and then clamped the templates to the work piece and ran a flush trim router bit over it. The flush trim router bit contains a bearing at the bottom which is in line with the cutting edge. So the bearing runs along the template beneath and the cutting edge cuts the work piece above to the same shape as the template. Multiple pieces can then be cut to the exact same shape. Once I had all my pieces cut I used a domino machine from Festool. The plans indicated dowel joints but after buying my Domino Machine years ago I don’t use anything else. A Domino Machine works in a similar way to a biscuit jointer but it cuts a long straight hole rather than the traditional round hole that the biscuit jointer cuts. A Domino made from birch is then inserted into the hole and it produces a mortise and tenon joint that is both strong an easy to cut. The birch expands slightly with the moisture of the glue so the domino fits tightly in the hole. They have grooves to allow the excess glue to squeeze out and are slightly shorter than the hole to allow them to be inserted completely. A very clever machine from Festool I must say and I am surprised that other manufacturers haven’t copied it. The pieces went together quite well but I did battle on a few of them where I couldn’t use the Domino machine so had to use epoxy as my glue and a nail gun to hold then in place. I bumped into the client years later and the bench was still in one piece so my method must have worked. I finished it with an outdoor timber preservative. I chose balau as my timber because it was to live outdoors and the balau holds up very well to the weather in Africa. 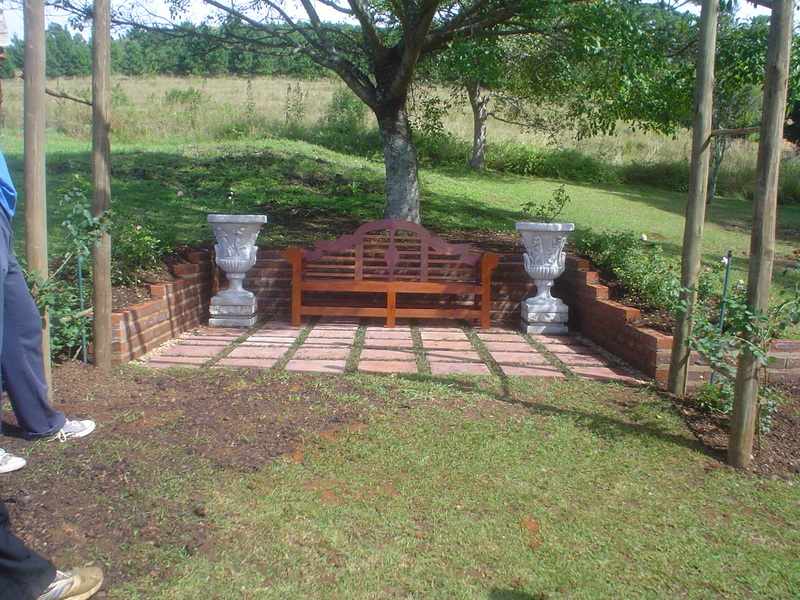 The client had built the area you see in the picture especially for this bench. It took me a while to leave after delivering it because it all seemed to fit so perfectly together in the setting they had chosen in the garden. For a free no obligation quote on outdoor furniture or any other timber work that you require please complete the form below and I will get in touch with you. Or you can call us on 031 – 762 1795.